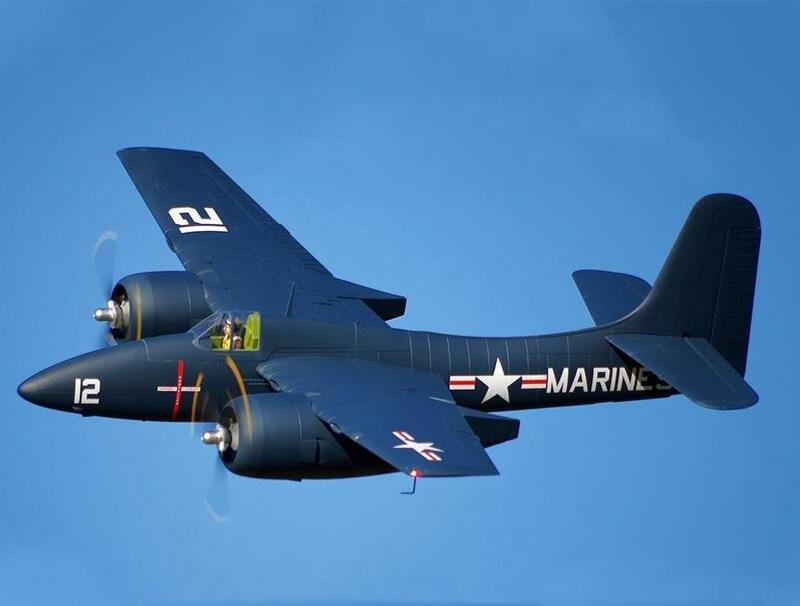 The Grumman F7F Tigercat is a twin piston engine aircraft developed during World War II. Originally envisioned as a carrier-based naval fighter, the Tigercat underwent several iterations and was later optimized for a variety of roles. Although World War II ended before it become fully combat operational, many variants of the Tigercat went on to serve in the Korean War in capacities including as a night fighter, ground attack platform, and a dependable reconnaissance platform. Today, the Tigercat’s renown as one of the highest performing piston driven aircraft in aviation history continues in peacetime at air races, air shows, and commemorative events celebrating the men and women who served with these aircraft. Honoring this famed aircraft, Xtreme Hobby is proud to introduce the FlightLine RC F7F-3 Tigercat, which is the world’s first mass production foam electric RC Tigercat. Officially licensed by Northrop Grumman, the FlightLine RC F7F-3 Tigercat’s 1600mm wingspan and 1/10 sport scale matches our popular P-38 Lightning, and the two look excellent in flight formation together! In the air, the FlightLine RC F7F-3 Tigercat exhibits fantastic stability, is very easy to control at a wide speed range, and has a predictable stall with easy recovery. We designed this aircraft to be a superb balance between top speed, vertical performance, flight duration, convenient transport, sport scale realism, and overall scale presentation. This is our seventh FlightLine RC warbird and it continues to innovate and raise the value bar for its owners. Own your model of the first mass production foam electric F7F-3 Tigercat in the world, and set yourself apart at your flying field today! Meticulously designed to incorporate EPO foam, wood, plastic, and carbon reinforcements, our design is easy to assemble and maintain, and delivers the strength and power to satisfy any RC airplane pilot. The main wing halves, horizontal stabilizer, and two engine nacelles each install with four screws. A new pliable ribbon wiring harness simplifies each wing connection to one instead of five, so the wing can be attached in less than one minute. The antenna and gun barrels are also designed to easily slide out to prevent damage during transport. A plastic nose cone, cowls, and doors are designed for longevity. As with other FlightLine RC warbirds, the F7F-3 Tigercat arrives expertly painted and ready to customize. Three tone painted engine detail sets the stage for a modeling detailer’s delight! Four sets of adhesive vinyl decals are also included in the box. Choose from these decals or recreate your own historic livery as you wish! The F7F-3’s generous main wing area allows a short takeoff distance of 15-20 meters, and its 70mm diameter nose wheel and 80mm diameter main wheels and thick steel struts are excellent for operating on typical grass airfields. An optional aluminum compression strut upgrade is available for atypically rougher grass conditions. The Tigercat’s tricycle landing gear reduces the risk of tipping forward after landing, and makes taxing on the ground very stable. Four flaps slow the aircraft for controlled power on landings at low speed. We recommend a Down Elevator Mix to correspond with flap deployment. For thrilling efficient power, the aircraft features a pair of 3748-600kv brushless motors, 3-blade 12x7 propellers (Standard and Reverse rotation), and two 60A ESCs. The Tigercat uses the same propeller blades as the FlightLine RC P-38, Sea Fury, F8F-1 Bearcat, and Spitfire Mk. IX. The model’s top speed is 125kph/78mph, and comfortable flight duration ranges between 6 and 7 minutes on a pair of 4s 3000mAh lipo batteries. For even faster speeds approaching 155kph/97mph and extended vertical performance, an optional Sport Power System utilizing 3648-880kv motors and 2-Blade 12x8 propellers is available for separate purchase.